Having completed the Industrial Revolution before any other State, Great Britain automatically elevated the threshold of power. As a logical consequence, from that moment on all other States of the international system that might desire to maintain their respective autonomies were obliged to carry out their own industrial revolution. To not become subordinated, all the States in the international system had to quickly industrialize. During the 18th century and the beginning of the 19th century France had been the main rival of England, as much in politics as in economy. Until the mid-17th century, “France was richer than Great Britain, though its riches were more poorly distributed, and the peasants in particular found themselves overwhelmed with very steep taxes, in favor of a landowner class that was practically inactive. Until the Industrial Revolution, French industry had been ahead of that of the English in the employment of complicated machinery and in the development of large factories. But the weight of the prolonged wars weighed heavily on the French economic system and hindered post-war France from assimilating or applying new production techniques based on vapor energy, until far after its establishment in Great Britain” (Cole, 1985: 83). France clearly emerged impoverished from the wars of Napoleon. Nevertheless, it preserved its traditional supremacy in the silk industry, its possessed an industrial bourgeoisiewith a marvelous talent for production of small quantities of articles of high quality, good taste and sky high prices.1 What’s more, the country provided for its own needs, in agricultural material, in such a way that it reached a certain degree of prosperity and a great capacity of accumulation of capital, as soon as the effects of war wore off. Nevertheless, “Politically and economically France was poorly equipped to rival with Great Britain in the global market. Its coal stores were small. In order to comprehend the logic that motivated the alliance the politically elite and the national bourgeoisie –fundamentally in the cases of Italy and Germany- it is also necessary to point out that, for the most lucid proto-industrials of the European continent, “it turned out to be evident right away that a community within the geographic scale of Great Britain, and that would possess the cohesion and solidarity that the political institutions of the representative government on a national scale had given the country before the end of the 13th century, meant the minimum unity if territory and population in which the industrial system could operate at a profit” (Toynbee, 1967: 89). Observing Great Britain, a small part of the politically elite as much of the Piemonte reign as of the disunited Germany understood that England had raised the threshold of power and that only the States that were able to industrialize themselves –as deeply as England had achieved- would be able to maintain their autonomy under the new economic conditions created by the Industrial Revolution. It turned out to be natural, therefore, to have confluence of interests between political men that were seeking for Italian unity on one hand and German unity on the other, with their respective national bourgeoisies (the proto-industrial elite), that had come to the conclusion that only within a State of like dimensions to those of Great Britain could they invest their resources and later obtain good profits. Great Britain added a new and determining characteristic to its already consolidated State-nation condition, that of industrial State, and thus raising the threshold of power and becoming, by it, the most powerful State in the international system. Thereby it became the only State in condition to “impose its will” on other members of the system and as a result, in the only actor in condition to “create rules of the system”, to its full benefit. When England raised the threshold of power it became clear that those who would desire to maintain autonomy of their States and not become –formal or informally- subordinated States, in “mere pawns” of the empire, formal or informal, that England was building, they should learn the lesson of the treasured British success. And what was the main lesson that Great Britain now took upon itself to hide by propagating an ideology that prescribed as a prescription of success a path totally different than the one it herself took to achieve it? For any observer aware of British history – that would not allow him or herself to be clouded by bursts of the ideology that England tried to impose as “the trend to follow”- the lesson was simple: “When [the British leading elite] a choice was to be made between business interests (that rested on the freedom to import, export and re-export) and those of industry (that rested in that stadium of the protection of the internal British market against foreign products and the capturing of exportation markets for British products), the local producer prevailed” (Hobsbawm, 2006b: 30). This goes to say that it chose the interests of industry over those of mere trade. It is also true that that choice was developed through an arduous upward push that was resolved not only by the clairvoyance of the British leading elite but rather also because “the merchant could only move London and a few other ports in defense of his interests, in as much as the manufacturer had on his side political interests of wide sectors of the country and government” (30). The objective data that history supplies us with goes to show that “the affair was decided upon at the end of the 17th century, when the cloth manufacturers, leaning on the traditional importance of wool cloth for the British estate, obtained the prohibition of importing foreign Indian cloth. British industry was able to grow at ease in a protected internal market until it became sufficiently strong to request free access into the markets of other peoples, meaning, free-exchange” (Hobsbawm, 2006b: 30). It would be wise to remember, by the way, that in Great Britain in 1750, which had approximately seven million inhabitants, the wool industry –which had emerged out of the State impulse produced during the reign of Isabel the 1st- still represented “the principal demand of industrial manpower. […] Using almost exclusively wool produced within the country, it was the most important exportation industry of Great Britain, as within the national market” (Cole, 1985: 32). 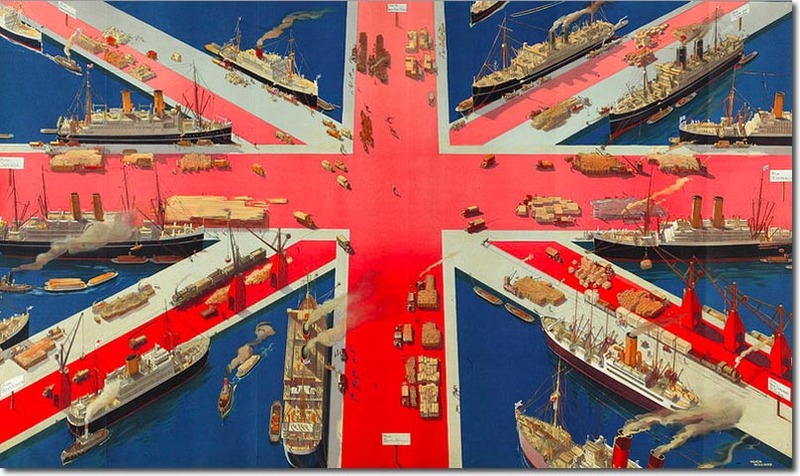 Those States that learned the lesson the very same British history gave them –and that did not allow themselves to be cajoled by the “song of the mermaid” of British intellectuals that preached free trade for exportation- tried to reproduce the same historic path towards development that the United Kingdom itself had followed to access the new threshold of power. The path that British history denoted consisted of creating a protected internal market so that the industry could grow at ease until becoming strong enough to be able to request free entrance into the markets of others. English history showed that it was necessary to apply a ferrous economic protectionism until being able to build an industry competitive enough to later “disinterestedly” council free-trade to other States. Those States that learned the lesson the English history had to teach them understood that those countries that did not become industrial State-nations were going to be the “chorus of history”, mere commentators, simple “receptors” of a history “made” by others. The particular historic British model –and not the one “invented” by intellectuals (ex post facto) for exportation- became, for the most lucid elite of the United States, Italy and Germany, the path to follow. Economic policies –truly executed ones and not those being preached- were taken as examples to be followed. In Europe, Germany and Italy – imitating the historic path taken by England - will be the next States – after Great Britain and France - to become industrial State-nations. During the second half of the 19th century the German struggles as well as the Italian take place, to reach their respective national unities, the first condition for reaching the current threshold of power. To generate a great industrial State, Otto von Bismark will culminate the German unity that had been anticipated by Zollverein, the customs unity between the German micro-States. In northern Italy, the Saboya monarchy and the Piemonte industrials and Lombardia generate the Italian unity to widen their markets and, thus, are able to break into the logic of the States that could be main characters in history. On the American continent, only the United States, after an arduous internal struggle, did not allow itself to be “wrapped up” by the supposed advantages of “international division of work” preached by Great Britain. On the enormous Asian continent, just only State will save itself from falling under British subordination by rejecting the theories published by Great Britain and becoming, vertiginously, the first industrial State-nation of the Far East, thus reaching the current threshold of power: Japan. The Industrial Revolution, whose epicenter was Great Britain, slowly bred the “second wave” of world globalization that deepened with the revolution of means of locomotion brought on by the railroad, the steam boat and the telegraph. Just as the caravels were the main characters of the first globalization, the transatlantic steam ships, children of industrial development –set out to sea from 1838 on-, were the same for the second “globalizing” wave. Thus it is worthy of clarifying that the second wave of globalization –as a process of increase in human relations and exchanges, commercial and capital, tending towards the unification of the totality of the inhabited and inhabitable world- just began to deepen around the mid-19th century, with the revolution of means of locomotion. With the railroad, commerce –that before had barely bit coastal trading posts and the mouths of large rivers- penetrates into the heart of continents. With iron ships and steam sailing, freight is cheapen to such an extent that it becomes very profitable for European countries to import wheat, leather, copper or coffee in large quantities. Without the railroad and transatlantic steamers, “voluminous and heavy raw materials could never have been amassed for industry, nor could there have been food enough for the industrial populations. They made the two new great social phenomenon of the era possible: general urbanization and mass emigration. Modern transportation provided an urgent incentive for technological development, allowing men to contemplate the whole world as a sole economic unit” (Derry & Williams, 2000: 529). As we have already affirmed, France, Germany, Italy, the United States and later Japan did not listen to the “songs of the mermaid” coming from Great Britain and they decided to carry out their own industrialization, ignoring the “disinterested advice” that the professor of Glasgow, Adam Smith, gave the world in his famous work An Inquiry into the Nature and Cause of the Wealth of Nations, through which England was able to open more markets for its industries than it had been able to with all of its cannons. It is during this “second wave of globalization” when, in a very neat way, the “center-periphery” configuration is generated that marks the world from the Industrial Revolution on. It is during this period when Spanish America begins its fight for independence, breeding at the same time a civil war –masked or open, depending on the cases- between those that envisage the independence process should end in the political unity of Hispanic America and those that, from port cities, allies of England, think that what is most convenient to their interests is that, once the independence wars are over, they conform around polis oligarchy, a multiplicity of Hispanic States. The defeat of Bolivar, San Martin, O’Higgins and Artigas seals the English project of fragmentation and makes Spanish America go from unity to dispersion. Differently, however, will the fate of Lusitanian America be that, through the monarchic formula and having the army as the backbone of the State, achieves containing the forces that bid on territorial fragmentation. In this way, Brazil saves its territorial unity and, therefore, its national unity. Nevertheless, in one thing will the fate of the two Americas be the same, the Lusitanian and the Hispanic, both will be incorporated into the international economy as providers of raw materials and importers of industrial products, without making any industrializing effort and missing, in that same way, the train of history for more than a century. Upon choosing the project proposed by Adam Smith, many of the Latin American republics were able to modernize their economies and achieve a relative important progress. But the chosen model contained within itself the germ of its own stagnation. Arnold Toynbee drew out, correctly, the consequences that the second wave of globalization born out of the Industrial Revolution had in the international arena of policy by holding that: “During the century that concluded in 1914, the world was economically conquered not only by the new Western industrial system but also by the Western nations in which it had been invented” (Toynbee, 1967: 79). Ergo, due to Great Britain and those nations that, ignoring the council of Adam Smith, they applied, just like England, a policy of strong State impulse into the process of industrialization. During the second globalization, the paradigmatic example of a great power that was left lagging behind, underdeveloped and dominated for more than century, due to omitting the industrialization process, was the great agrarian empire of China. Opposite massive China was a small island, Japan, deprived of all raw materials –the same ones China possessed in excess- and thanks to an accelerated plan of industrialization –stoked, as in all successful cases, by State impulse- it would become, from 1870 on and in the extremely brief historic lapse of fifty years, in an industrial power and would reach the current threshold of power, a condition which –worthy of pointing out once again- is indispensable to maintain national autonomy. Precisely due to that Japan ended up becoming the only Asian country that was never submitted to European colonialism. 1. The beginning of French industry – fundamentally specializing in the manufacturing of high quality and high priced articles - can be historically dated to the Thirty Year War, put to an end in 1648 by The Peace of Westphalia. From a political standpoint, France was the great conqueror of that war. However from an economic point of view, it emerged from the conflict in ruins. Luckily for France, a wise economic policy aided it in recovering astoundingly. With Jean Baptiste Colbert (Exchequer and Secretary of the Navy during the reign of Luis the 14th) the French State made its first great State impulse in order to reach a deep industrialization of the kingdom. Luis the 14th’s bright Minister, taking the English economic policy as an example, lifted taxes and granted important subsidies for manufacturing production, while at the same time establishing strong tariffs for foreign products. The success of Colbert’s economic policy was vertiginous: in just a few years numerous textile, crystal and ceramics factories emerged. Furthermore Colbert – as a response to the Law of Navigation established by Oliver Cromwell in England - placed great restrictions on the entrance of foreign ships into French ports while at the same time promoted the naval industry for the construction of barges, as much for merchant use as for war. Colbert, following the example of Isabel the 1st of England, systematically tried to “attract foreign businesspeople and specialized workers through the granting of no interest loans, premiums and through the payment of certain capital costs: in this way he obtained Italians to manufacture mirrors and encasements; German and Swedish miners and foundry hands arrived, as well as Dutch fabric vendors, possessors of the ancient Flemish tradition. […] It is undisputable that the industries of wool, silk and other French textiles owed much to the Colbert government. A tradition of artistic production was created that survived the 17th century and that in many aspects determined the course of industrial development in France for one-hundred and fifty years” (Friedlander &Oser, 1957: 102-103). 2. It was barely in 1892, too late to overcome the advantage obtained by Great Britain and Germany, when France decided to reduce its dependence on goods of imported capital, from Great Britain and Germany, through a serious State impulse. But only after the recuperation of Aliscia and Lorena was the French government able to reach its strategic objective of developing heavy industry. On the history of the French industrial development see John Clapham (1936), Shepard Bancroft Clough (1939), Pierre E. Levasseur (1912). 3. “In a literal sense, it is possible that Great Britain would never have been the worlds workshop, but its industrial pre-dominion was as such around the middle of the 19th century that the phrase is legitimate. It produced possibly two thirds of the world’s coal, maybe half of its iron, five sevenths of its scarce production of steel; approximately half of cotton cloth produced on a commercial scale and 40 percent (in value) of its ironmongery” (Lichteheim, 1972: 79). 4. “Elizabeth the 1st promoted national English economy by protecting the newborn industry of the kingdom. Until that time England sold off its abundant production of wool mainly to Holland, where it was later processed. Through a skilled policy of fomentation, Elizabeth was able to attract the Dutch weaving technicians that had been expulsed by Felibe the 2nd of the Netherlands to come to England. Technicians who, once installed in England, supported and protected by the State, began to develop the textile industry that grew to become one of the main pillars of the English economy. Isabel developed the internal market for the nascent industry by establishing minimum wages, issuing different protective laws over peasants and providing work for the poor. During the forty-five years of Isabel’s reign, England enjoyed an extraordinary economic prosperity. It is possible to affirm that England lived a first industrial revolution between 1540 and 1640, characterized by investments in new industries like mining, metallurgy, breweries, sugar refineries, soap manufacturing, alum, crystal and salt. The surge in coal extraction began in Isabel’s reign and from there onto the revolution of 1688 its production increases 1500 percent; it goes from 170,000 to 2,500,000 tons. A level that France barely reaches in 1834” (Trias, 1976: 6). 5. “On April 8th, 1838 the Great-Western (L 64.60 meters, I 10.60 meters, 1,340 tons, built of wood, 800 tons of coal, of which 650 were used for the voyage to, and 393 on the return trip) left Bristol en route to New York with seven passengers, there were no other volunteers. It arrived April 23rd. The Great-Western returned with seventy-six passengers and took fourteen days to complete its course” (Brossard, 2005: 477). 6. The policy tending to ban the exportation of machinery and the emigration of qualified workers was a permanent policy of Great Britain from even before the Industrial Revolution. In 1765 the British Parliament ratified the prohibition of emigration of skilled workers and tried to apply the ban to exportation of machine models and blueprints and the machines themselves. After the Industrial Revolution, these measures became more extensive and were applied with greater rigor and vigilance. NYE, Joseph, “Política de seducción, no de garrote”, Clarín, Buenos Aires, 11 de septiembre 2006. .